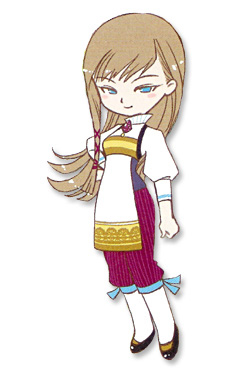 When you’re a single woman in the Harvest Moon* universe, your identity is tied to what job you have, and the chance that a random stranger will whisk you away to live on a decrepit farm outside of town as his wife. So your style has to serve both these paths–genius mechanic slash devoted spouse, passionate nurse slash doting mother, shy librarian slash rugged outdoorswoman, tolerable alcoholic slash lovable alcoholic. 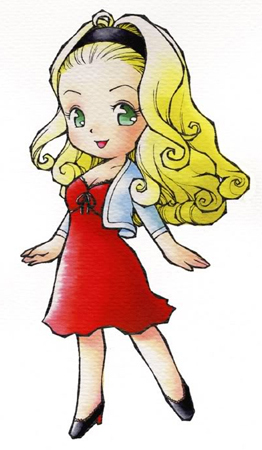 In the first Harvest Moon on SNES, bachelorettes changed clothes once married, donning a drab, long lavender dress and identically-styled hair as they settled into being decorations in your expanded cottage. Later installments allowed wives to maintain their independence and continue going to work or take on new responsibilities, while keeping their pre-betrothal garb. So who benefited most from this small style victory? *Note: This list will only consider Harvest Moon bachelorettes. This excludes spin-off series like Rune Factory, as well as any female characters that cannot be married. Some bachelorettes appear in multiple games: we’ve listed the game with their preferred outfit version. Popuri earns points right off the bat for not following in Nina’s amorphous pink blob footsteps. 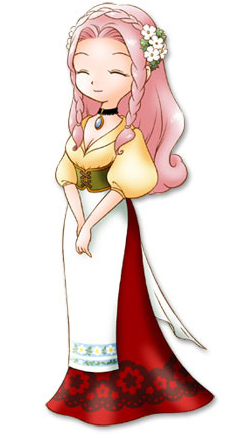 This dress feels very 19th century, which works for the timeless world of Harvest Moon (most entries have television sets, but no tractors?). The heart-shaped bodice and puff sleeve are the perfect feminine accents for upbeat, youthful Popuri. Her dress skirt is a bit long and heavy for farm work–she lives on a ranch even before you attempt to woo her–but I’ll forgive the dress excess because it balances out her ridiculously abundant pink curls and should keep her from tipping over. 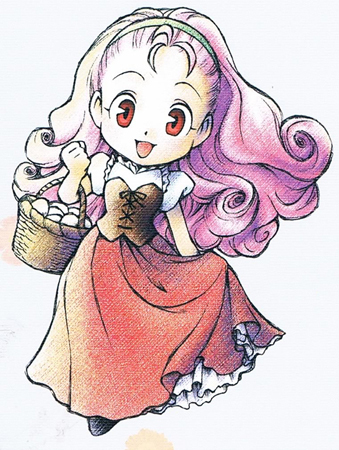 Muffy is the updated version of HM SNES’s Eve: both are bubbly barmaids whose style consists of a red dress and volumized blonde hair. Muffy beats out her predecessor for a few reasons: her short, A-line dress can easily transition between day and night wear while Eve’s strapless evening gown with thigh-high slit is way over the top for her one-horse town. Muffy dresses down even further with a three-quarters length cotton sweater and basic thick headband, but maintains some spice with black pumps brightened by red soles. This is a great way to do chic while living in a village where cows outnumber people five-to-one. Gwen’s outfit perfectly combines her career and style into one showpiece. As a rancher, her leather gloves and knee-high boots are functional, and the buckles used to hold them on add a jewelry-esque flair. Her wrap skirt is comfortable yet feminine, and the black tights accentuate her long arms and legs. Her midriff is a bit overexposed, but the red crop top adds a nice pop to the otherwise neutral ensemble that should hide dirt and horse surprises nicely. Most characters would lose points for sleeve puffiness, but Lyla pulls them off. The tight olive bodice offsets the bulbous sleeves and gives her an impossibly long silhouette. There’s some drastic color variations here with the muted olive; scarlet red; and the warm, almost burnt yellow blouse, but her minimal accessorizing keeps everything grounded. The cameo necklace, faded flower detailing on her skirt’s hem, and half-hidden bouquet headdress create a delicate balance from pink head to toe. Plus, she just looks impossibly pleased with herself: this is a woman who’s comfortable in her own skin and clothing. I can’t speak to Freya’s work-attire-appropriateness since I haven’t played Grand Bazaar and the only info on her job is “works in the nearby town.” She’s either wearing an extremely flattering apron or has attached half of a gown to her outfit as a dress-illusion. Her fuchsia pedal pushers cuffed with turquoise ties are the eye-catcher of this ensemble, but the rest is nothing to sneeze at. The ruffled turtleneck, ruby brooch, and Juliet sleeve all scream “classic.” The only distraction is the half-braid in her hair: maybe it’s extra thread in case she rips her pants, so accepted for functionality. 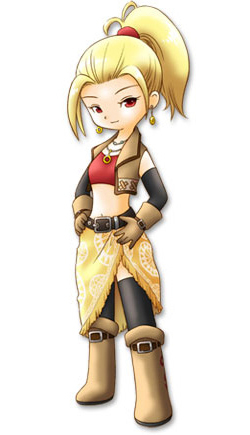 Laney is one of the few Harvest Moon bachelorettes to don a full updo, via an intricately braided bun. She even has most of her bangs held back with star-shaped barrettes, which is a courteous choice when you work in food services. Her outfit is extremely laid back and comfortable, yet has little touches of style throughout: the rolled up sleeves on her cardigan, the bowless sailor collar, and the tiny peek of red socks just over the top of her boots. She loses points for choosing a color ensemble that’s one rotation away from an American flag–complete with stars, no less–but maybe she’s just a super patriotic Bluebellian, which is a city in, let’s say, Michigan. Reina’s outfit probably shouldn’t remotely work, but I love it all the same. She’s rocking the Yuna-style anti-gravity half-sleeves and a lovely muted color palette that makes her dark hair and eyes really pop. The pastel stripes on her sleeves provide the only real non-turqoise color on her, so it’s nice that we have the same pattern on her stockings as well. I can’t tell if she has long hair, curly hair, straight hair, dreadlocked hair, but it at least seems manageable for her job as a botanist. Plants don’t care if your hair is a hot mess. I feel like I have to include Yuri since she’s a fashion designer, so not liking her outfit is synonymous with being a tasteless rube. She has a very androgynous, pirate-apprentice vibe going on. The combination of toreador pants, suspenders, and open vest is strangely appealing, especially in various shades of olive. You’d think her rusty red hair would clash with the fuchsia bow-tie, but it doesn’t! Is that enough praise to prove we’re fashion-forward? There’s a lot going on here, and all of it is awesome. Obviously the Witch Princess dresses how she pleases, as her job before potentially mesmerizing the local farmer is…witch princess. The sleeveless sweater tube dress, Roman sandals-meet-’80s leg warmers, and cape apparently made out of shadows all have the potential to go horribly wrong, but they work here. Even her color palette of “every shade of purple except Grimace” flows, thanks to her contrasting blonde locks and the hints of skin peeking out between purple. My only complaint is the pattern on her dress: too borderline Christmas sweater with those reindeer antlers. Would prefer her old standby, skulls. Just like the Witch Princess, the Harvest Goddess receives a pass on any lack of work-dress balance. And, to be fair, this dress with a wedding gown-length train certainly won’t make picking potatoes any easier. 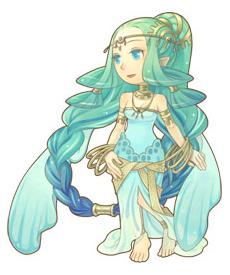 But the Goddess lives in a pond, so a dress that basically looks like a waterfall eating a mermaid is both gorgeous and appropriate. I love the subtle transition from sky blue to nearly white at the hem of her dress like a wave coming to shore, as well as the different shades of turquoise throughout her hair–which is somehow thicker than her body, thanks Biotin. Everything about this screams flowy elegance, except the weird tasseled hair sideburns. Snip those suckers and dump them in a different goddess’s lake. This entry was posted in Fashion, Video Games and tagged Harvest Moon. Bookmark the permalink. *Hating the Harvest Goddess (whom all the townspeople love) for no discernable reason. I’m glad someone finally put that uppity Goddess in her place. *Playing pranks on Harvest Goddess/townspeople. Because that’s funny to her. *Sleeping till after noon. So dastardly. *Whereas the rest of the towns people like it when you give them gifts, she likes it when you litter or give townspeople poison mushrooms or even throwing terrible items into the pot for the Harvest Festival. Because that’s funny to her. *Most other bachelorettes require you to stroke their fragile egos with compliments and junk. 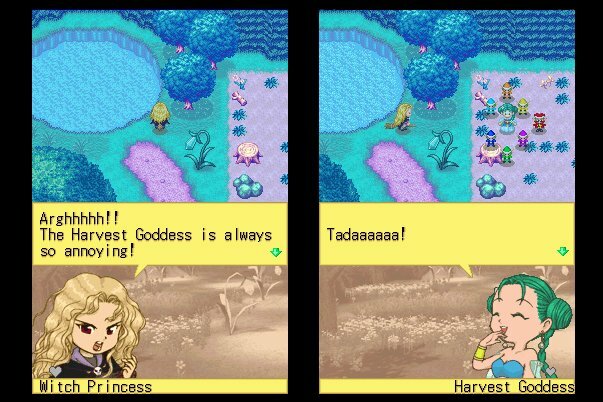 All you need to do with the Witch Princess is talk trash about the Harvest Goddess. 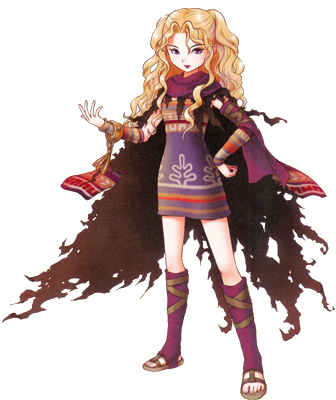 Also I haven’t played New Beginning, but that new version of her looks great. Isn’t it also true that killing your animals wins you points with the Witch Princess? That’s pretty crazy… haha. 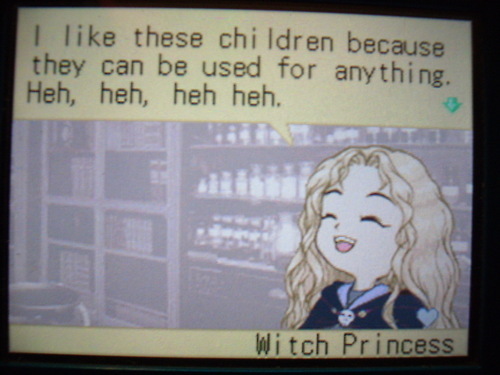 I’ve never actually played a game that features the Witch Princess, but it seems like it would be a fun challenge to woo her. You know, I have heard that rumor but as I’m usually too busy farming to raise animals, I can’t confirm. At the risk of alienating the world though, I must admit that makes me like the Witch Princess even more! Who’s your fave from Tree of Tranquility? I married Kathy (I love the country rancher bartender types), but I think Candace has a really cute design as well. I played Animal Parade instead of Tree of Tranquility, but I believe the marriage candidates are the same? Candace is definitely a favorite–always love getting to know the shy Maria types–but I wooed Selena in that one. And Chase when playing as a girl. One of the few guys who can rock multiple barrettes in his hair. Haha, and I never played Animal Parade, so I didn’t realize that. Interesting! Ah, Chase was a man among men. Apron, hair accessories… what’s not to love? 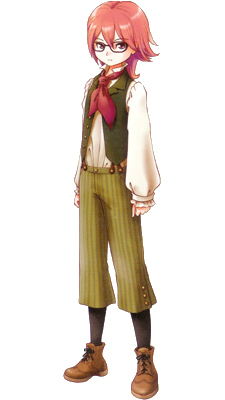 I’ve never played Harvest Moon because I could never get a sense of the game proper, but I would love to now. Some of those designs are really cute. Oh man, Harvest Moon is a longtime favorite around here. Highly recommended! 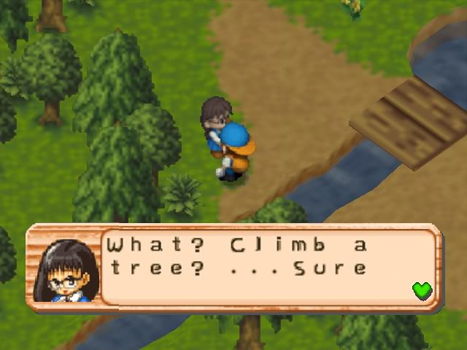 If you have an original DS or GBA, “Harvest Moon: Friends of Mineral Town” on GBA is one of the best entries in the series and a great place to start. I’ll give it a try when I get some more money in.